or Lawh-i Habib (Tablet for the Beloved One) of Mirza Husayn `Ali Nuri, Baha'-Allah for Mirza Aqa-yi Munib, Habib, the One Beloved. Edirne dating to c. 1864-5. MS in the hand of Zayn al-Muqarrabin (Baha'i World Center, Haifa Israel). AQA (ed, ) IV : 1-23. 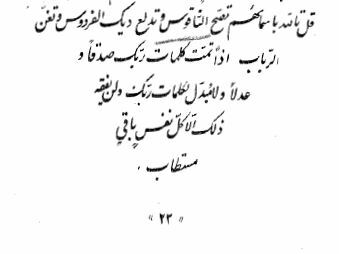 See also text printed in Surat al-ashab in, Athar-i qalam-i a`la, vol. 4 Tehran: MMMA [Baha'i Publishing Trust], 125 BE/1968), 205-239. . . In the Name of God, the Splendid, the All-Glorious, the All-Glorious. "Within the throat of this youth [al-ghulam] lie imprisoned words [lahn`an accent/ melody'] that, if revealed to mankind to an extent smaller than a needle's eye, would be sufficient to cause every mountain [al-jibal] to crumble, the leaves of the trees [al-awraq] to be discolored and their fruits [al-amthar] to fall; would compel every head to bow down in worship and every face to turn in adoration towards this omnipotent ruler [al-malik] who, at various times and in diverse manners, appears as a devouring flame [haykal al-nar], as a billowing ocean [al-bahr], as a radiant light [hai't al-nur], as the tree which, rooted in the soil of holiness, lifts its branches and spreads out its limbs as far as and beyond the throne of deathless glory" [trans. Shoghi Effendi, WOB:108-9]'. At another time thou shalt discover Him to be in the Temple of the Beloved One (haykal al-mahbub) yet in this Garment (al-qamis] which none amongst all the creatures can ever compehend! Were the gnosis (irfan) of Him to be desired by anyone, the result would be that they would swoon away within their own beings [souls] (arwah); save, that is, such as their Lord hath accorded a solaced heart (qalb salim). This is indeed the Desired One (al-maqsud) [confirmed] from the Beginning which hath no beginning! This is indeed the Divine Countenance (al-wajh) towards which all faces hath been oriented, though many, at this moment, fail to be numbered among such as are endowed with insight (al-sha`irin)! By God! Whomsoever rejects this Manifest (al-zahir), Brilliant (al-bahir), Transcendent (al-muta`aliyy) and Luminous (al-munir) Divine Bounty (al-fadl), it shall prove necessary for him to enquire regrading his state (hal) from his own mother (umm)! So shall he be returned to the nethermost abyss of Gehenna (asfal al-jahim). Say: How can ye be assured within thyselves that if thou reject [p.4>] these verses (al-ayat) your very faith (al-iman) in the [previous] Mesengers of God (rusul Allah) or in `Ali [Muhammad, the Bab] aforetime, can be confirmed?. Nay indeed! By the Lord of all the Worlds (rabb al-`alamin)! And by God! the True One (al-haqq)! 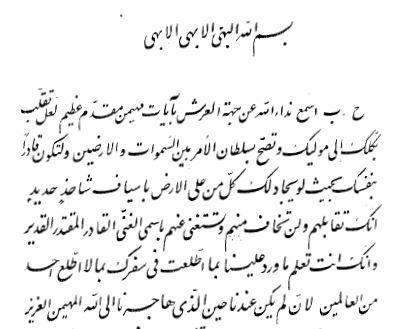 The very pre-eternal human particles [atoms] (al-dharrat) and beyond them the Tongue of Destiny (lisan al-qudrat), as well as the Tongue of Power (lisan al-quwwat), the Tongue of Might (lisan al-`izzat), the Tongue of Grandeur (lisan al-`azimat) and beyond these the very Tongue of God Himself (lisan Allah), the Powerful. the Mighty, the All-Wise (al-muqtaddir al-`aziz al-hakim), do affirm that this is something untruthful!